On September 25, 1949, Otis Martin picked up the 1st last-place finish of his NASCAR Strictly Stock career during the 200-lap race at Martinsville Speedway when his #4 1948 Buick retired for unknown reasons after 16 laps. That day, H. Clay Earles’ iconic paperclip track was barely two years old. It was six years before the surface was paved and seven before the first 500-lap race was held. Just 15 cars would brave 200 bumpy laps on the flat dirt oval, but each would become a part of history. Martinsville Speedway is the only track from NASCAR’s first “Strictly Stock” season to remain on today’s calendar. Martinsville was also the sixth of the eight races run that year. 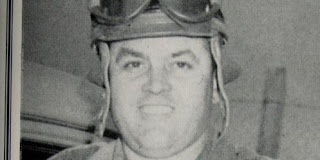 34-year-old Alabama driver Robert “Red” Byron had only run four of the previous five events, but was well on his way to etching his name on the first championship trophy. A dirt track star who was wounded while serving with the Air Force during World War II, Byron had wheeled his black #22 Oldsmobile to victory in the second round at the Daytona Beach-Road Course and had only once finished worse than 3rd. Under NASCAR’s developing point structure, this put Byron 140 points ahead of fellow dirt track legend Bob Flock. As of this writing, the Martinsville race is one of only two events from 1949 where the starting order is known. Curtis Turner took the pole ahead of Flock and Byron. Starting 9th was Otis Martin. Martin was a local driver, his birthplace of Bassett, Virginia just under 11 miles from the Martinsville track. He and younger brother Leonard “Pee Wee” Martin were among the 33 starters in the season opener on the Charlotte dirt track - Otis came home 20th, Pee Wee in 28th. The older Martin began the year running an old 1948 Ford, #19, and two months after overheating problems at Charlotte improved to an 8th-place run at the one-mile Occoneechee Speedway in Hillsborough, North Carolina. For Martinsville, Martin would switch to Buick in what was to be Raymond Lewis’ first Strictly Stock start as a car owner. What happened to Martin’s car that day in 1949 has been lost to history. All that is known is he took the 15th spot from last-place starter Archie Smith, a 20-year-old from North Carolina who was making his 2nd and final Strictly Stock start. The next retiree was Bob Flock, who lost 2nd in points to Bill Blair as a result. Meanwhile, Red Byron took the win by three laps over Petty family patriarch Lee Petty, and would go on to become NASCAR's first Strictly Stock champion. Martin competed in 23 Strictly Stock races during a seven-year career, earning a career-best 6th driving a Mercury with car #100 in his 1953 return to the Charlotte dirt track. The Martinsville race remained his only last-place finish. He made his final start in the 1954 Southern 500, where he finished 25th in a field of 50 driving a Chrysler numbered 48. Martin died the very next year at just 37 years old. *The #4 wouldn’t finish last in NASCAR’s top division again until April 27, 1952 when Roscoe Thompson’s #4 Air Lift 1951 Oldsmobile crashed after 12 laps of a rain and darkness-shortened 198-lapper at Central City Speedway in Macon, Georgia. *The #4 wouldn’t finish last at Martinsville again until April 23, 1978, when Gary Myers’ #4 Spencer’s Baby Wear Chevrolet fell out with a broken transmission after 13 laps of the Virginia 500. As in 1949, the margin of victory was three laps - this time Darrell Waltrip over Neil Bonnett. The number hasn’t finished last there since, and as of this writing, current #4 driver Kevin Harvick has yet to trail a Sprint Cup points race.